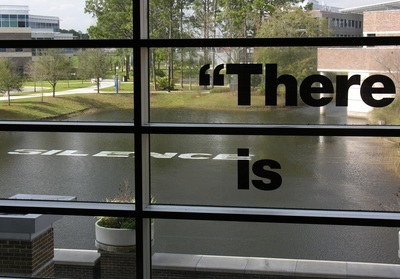 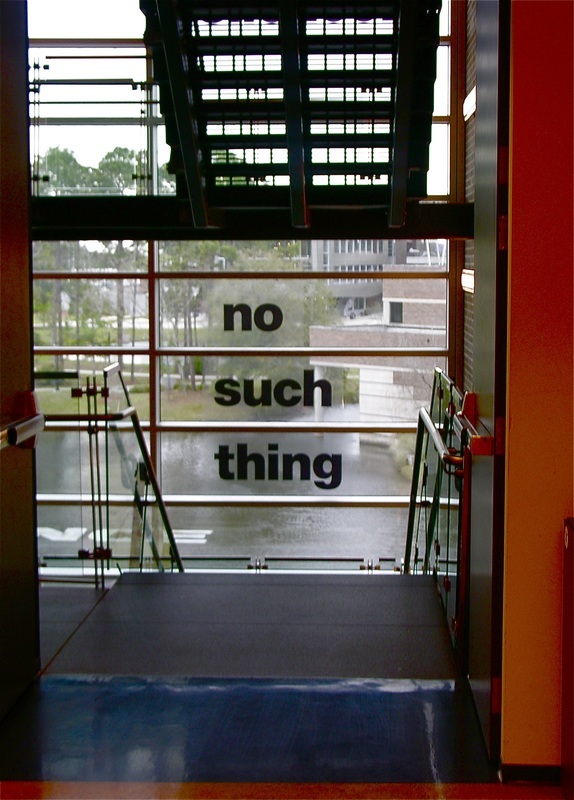 In conjunction with UNF’s John Cage Festival celebrating the American composer’s centenary, this installation was made up entirely of Cage’s own words. 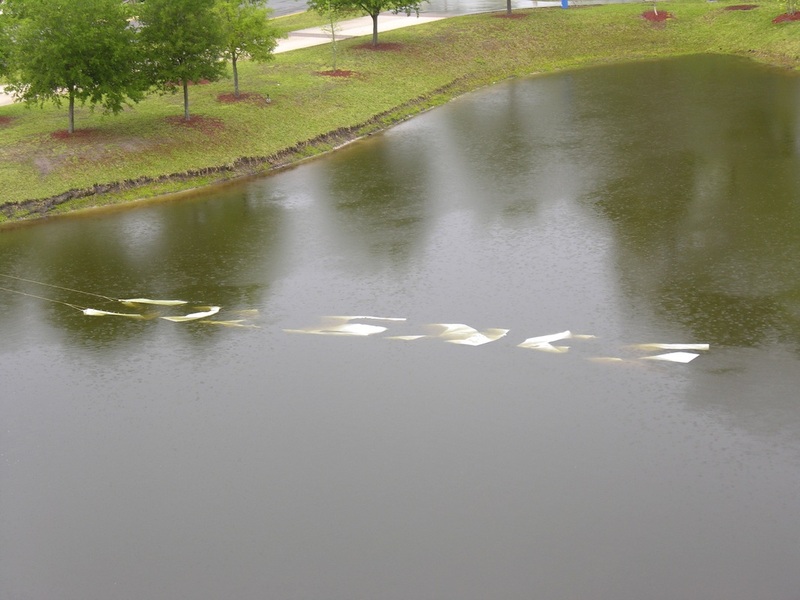 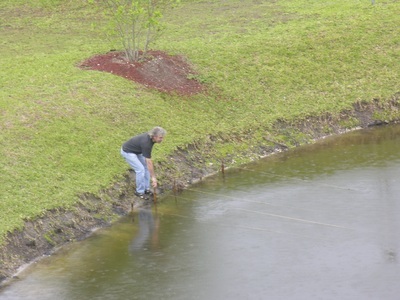 On the pond, there was the single large word SILENCE floating alone on the water. 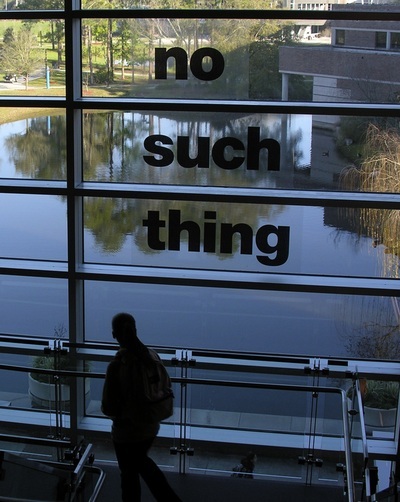 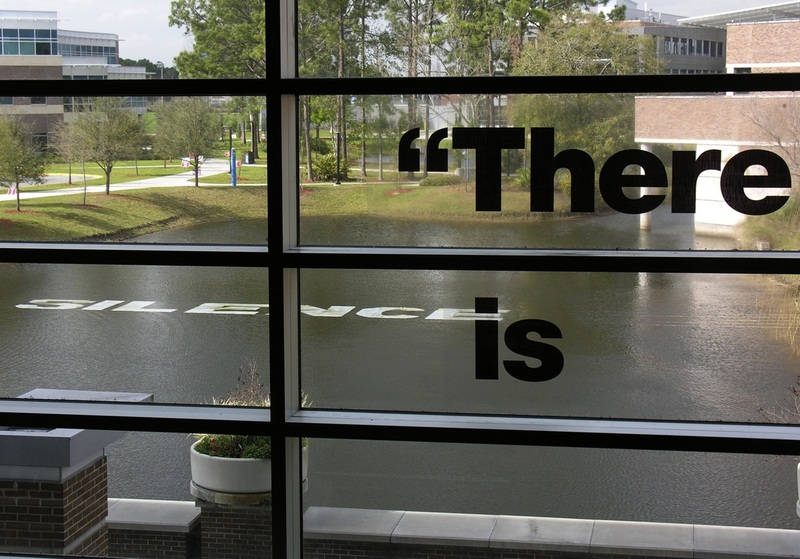 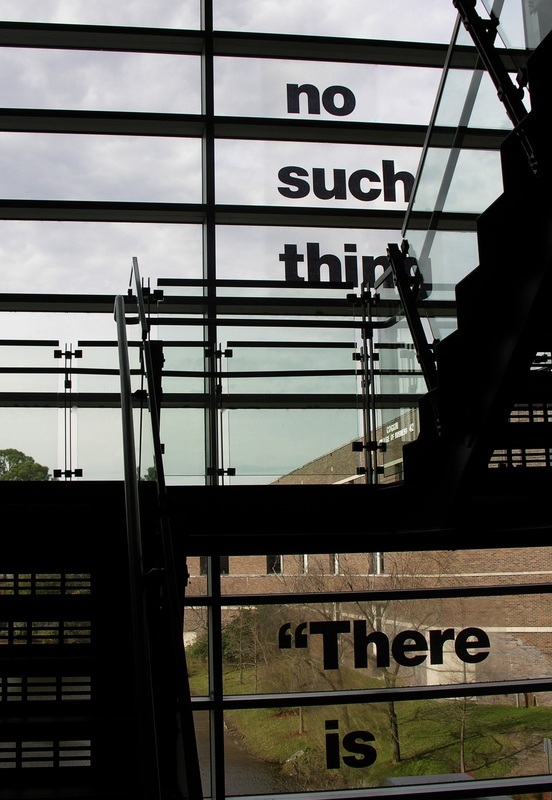 While on the library’s windows, one read the words THERE IS (between the first and second floors); NO SUCH THING (between the second and third); and AS SILENCE (between the third and fourth). 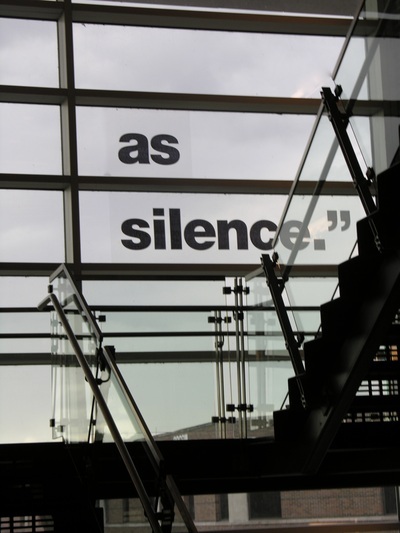 This line, “There is no such thing as silence,” is one of Cage’s most well-known, and most paradoxical. 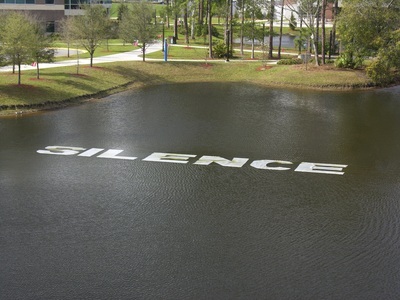 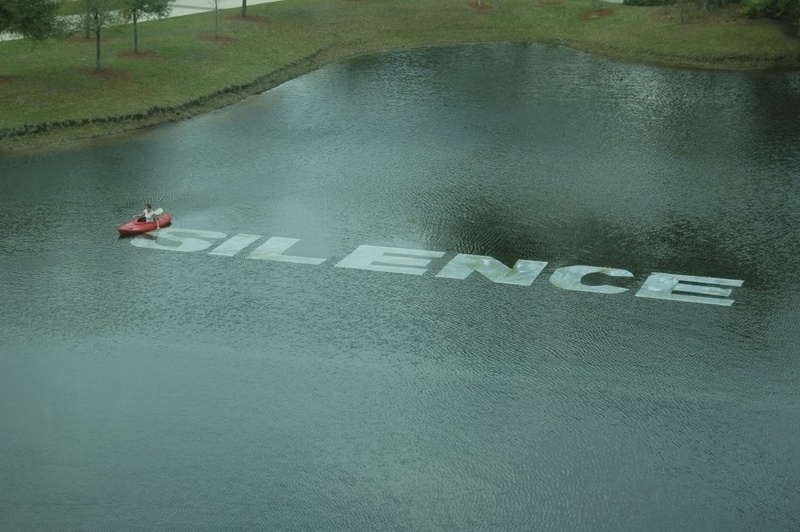 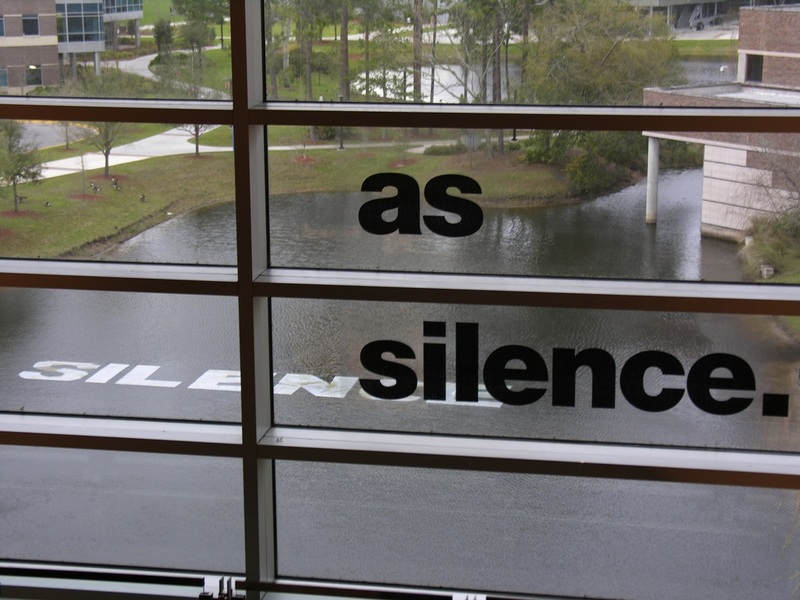 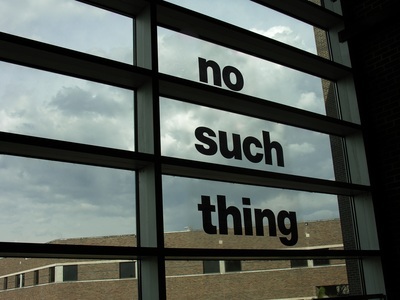 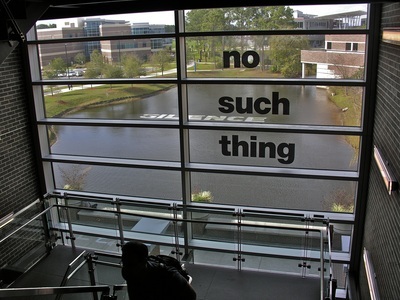 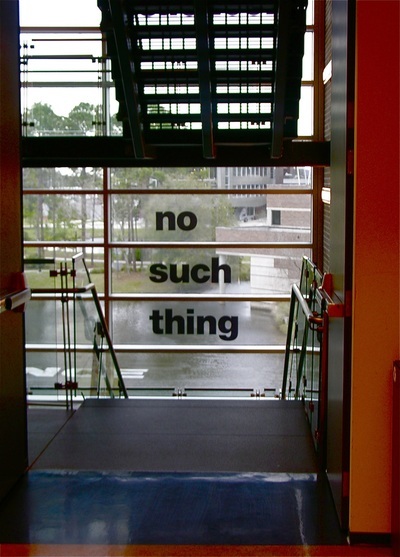 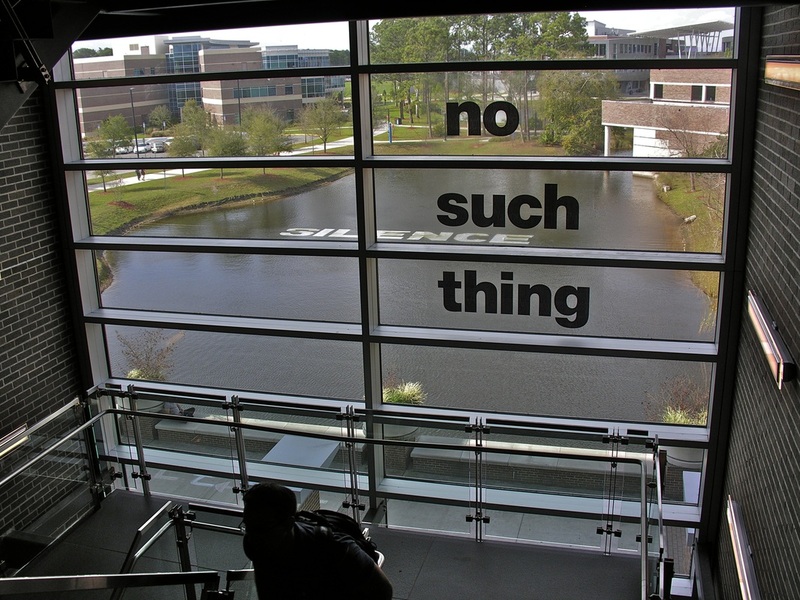 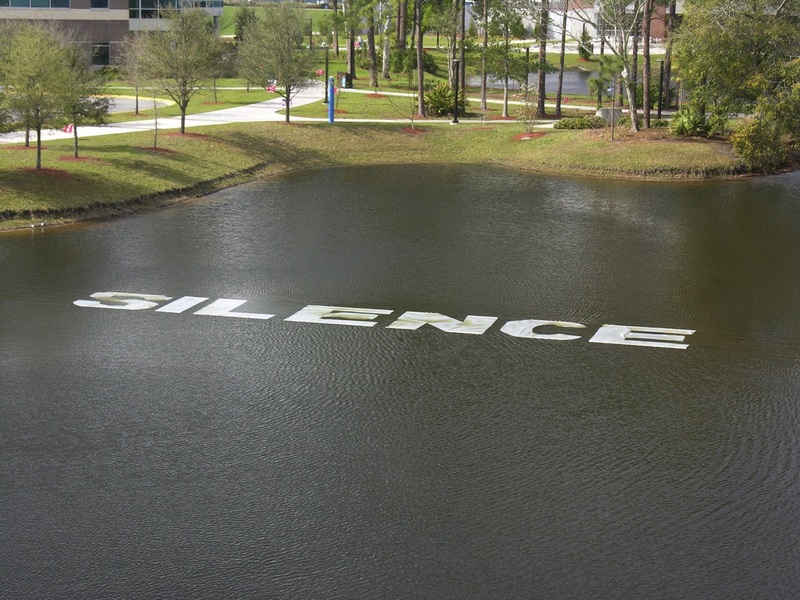 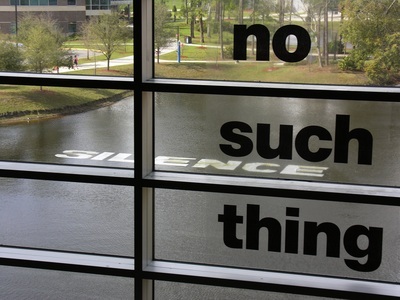 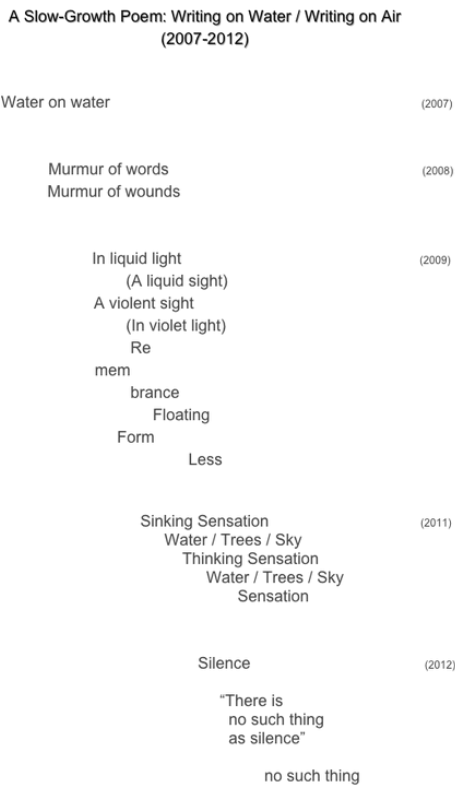 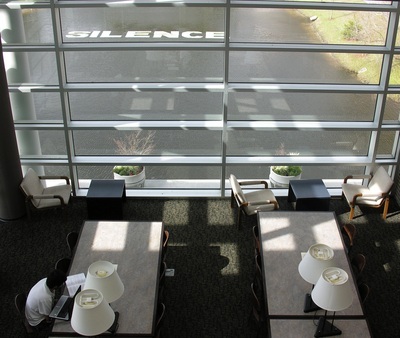 And with this installation, there was materialized something of Cage’s evocatively mixed message, with the word SILENCE written largely, loudly, on the water, while the words on the windows – the sentence only fully read if moving to the library’s top floor – imparting a conflicting thought, one of denying silence: NO SUCH THING. 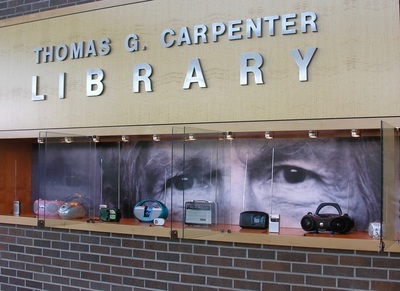 In addition, in the Library’s showcases, there was an accompanying display of 12 battery-operated radios arranged in a row (with Cage’s face printed boldly just behind). All of the radios were tuned to different stations and, entering the library, you could faintly hear their transmissions mixing together — of songs, of words . 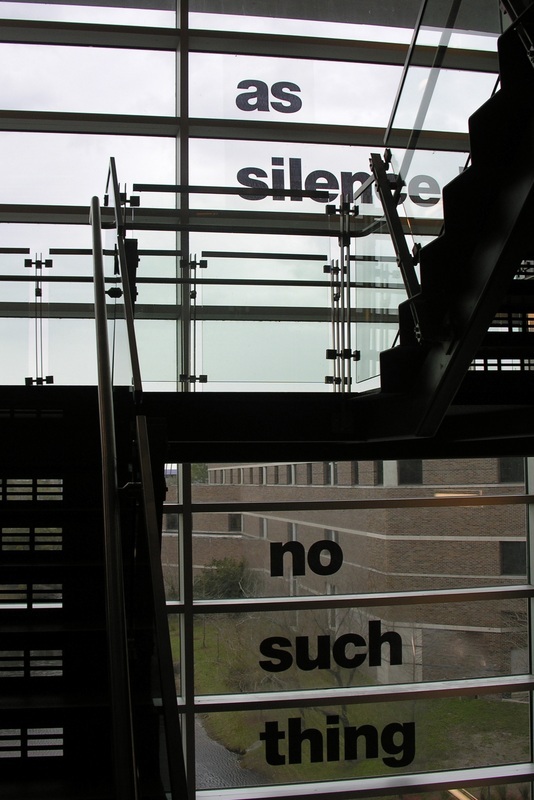 . . staticky signals and muffled voices — broadcasting behind the glass. Over time, one by one, the batteries died on each of the radios, the showcases gradually going silent. 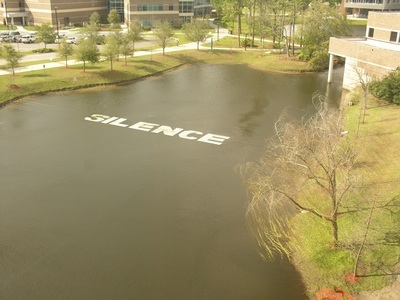 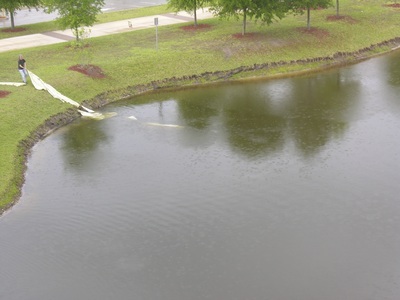 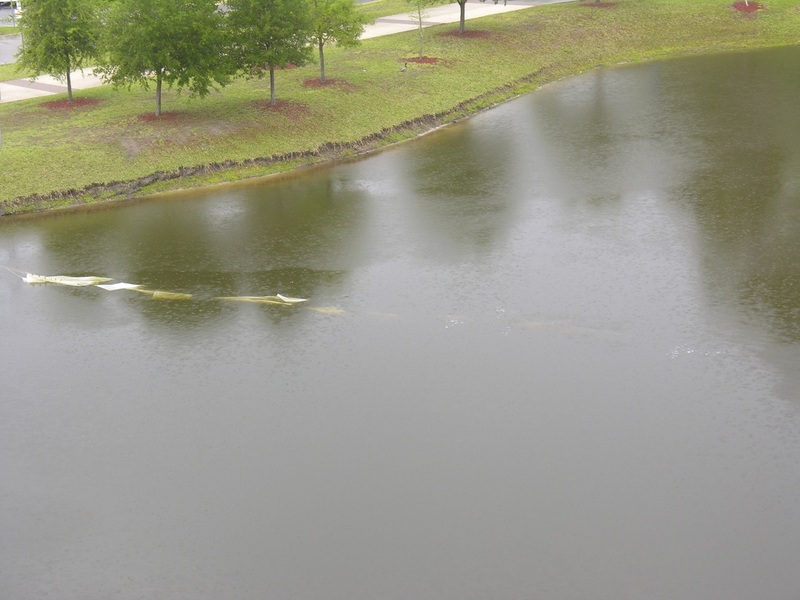 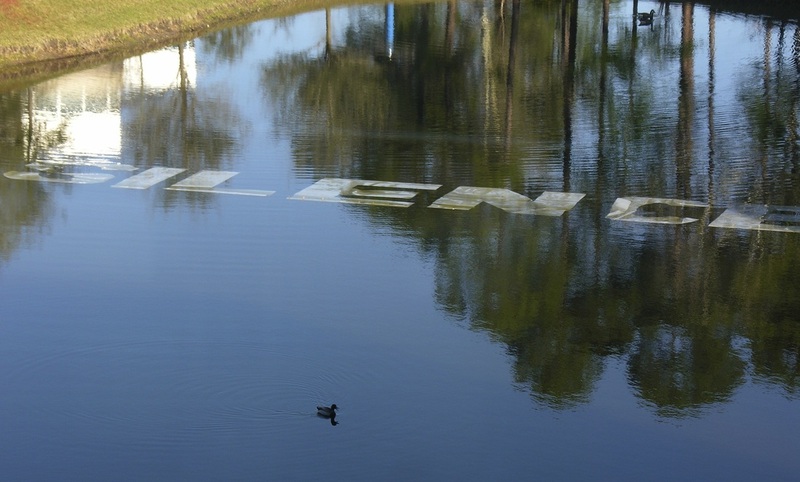 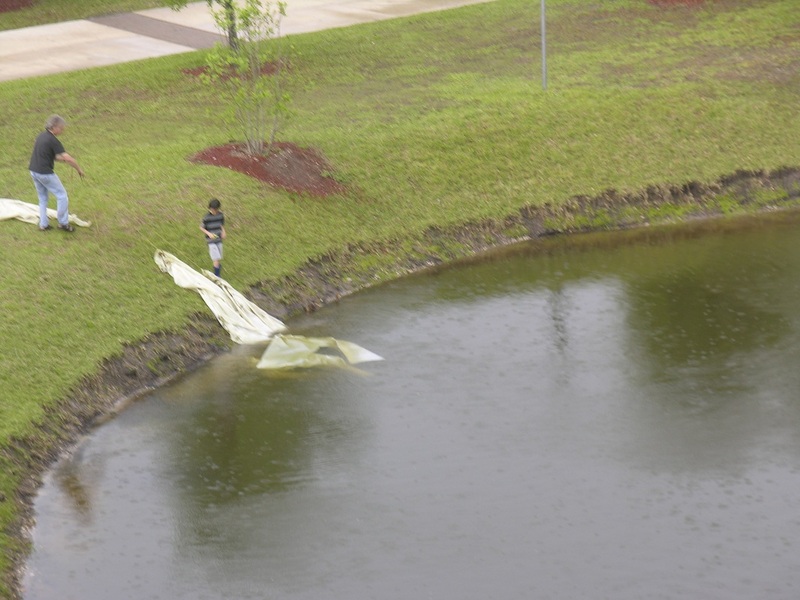 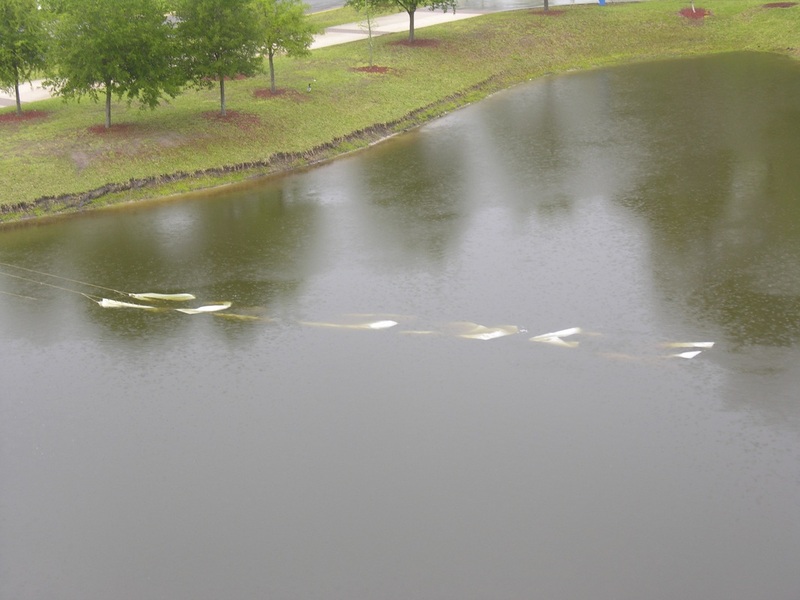 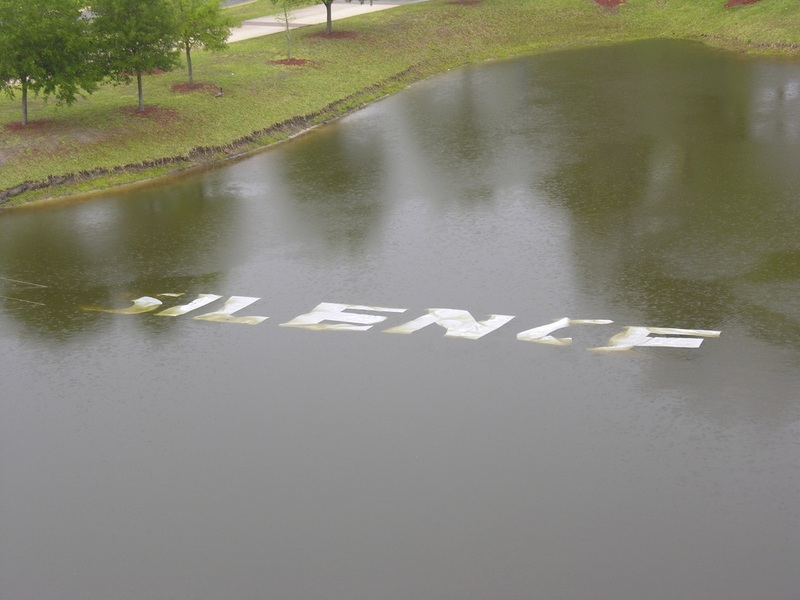 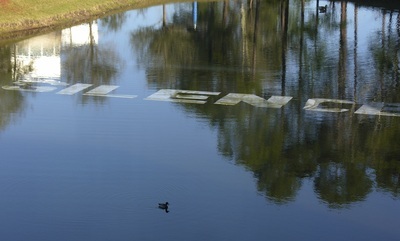 The final event of this installation, its final silencing, was when the word SILENCE was unceremoniously pulled from the water, restoring the pond to its uninscribed condition, back to its silent surface. “Suspicious Silence: Walking Out on John Cage.” Current Musicology (Spring 2014), No. 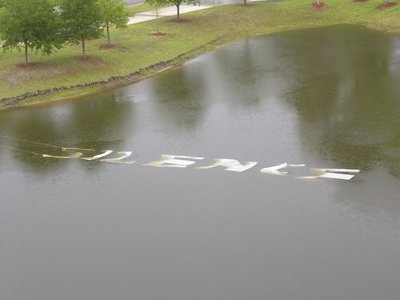 94: 127-142. 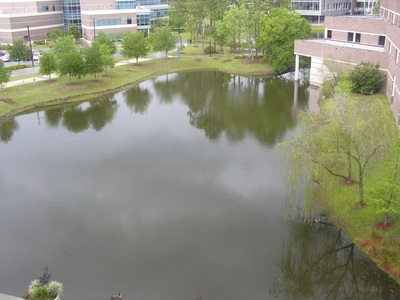 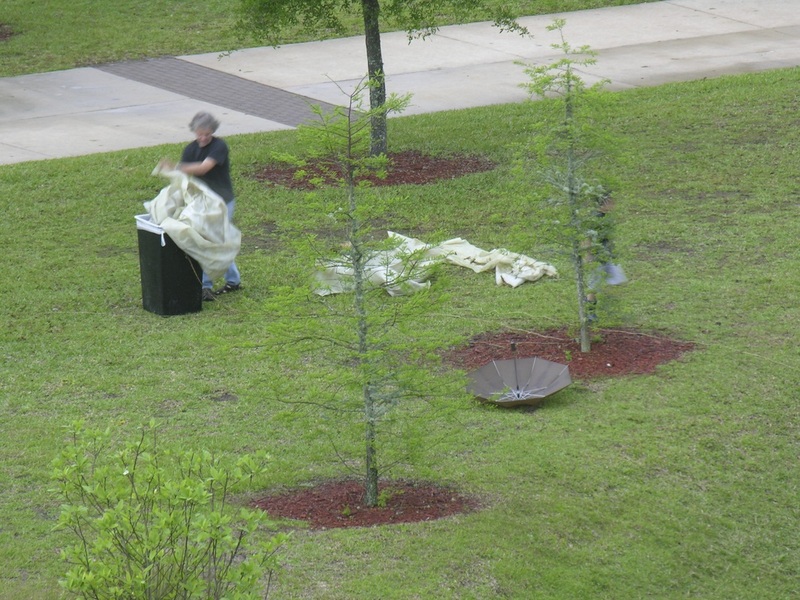 “John Cage Festival: 100th Birthday Celebration,” at UNF, March 2012, with performances by sound artist Jaap Blonk (Holland), violinist Tom Chiu (Flux Quartet), pianist Louis Goldstein (Wake Forest University), as well as local and regional artists and musicians. 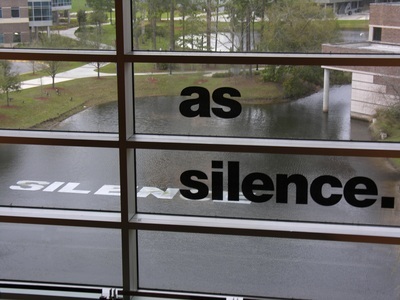 Many thanks to all of those who assisted with this installation: Michael Boyles, Ashton DiVito, Grant Kittrell, Joseph O’Connor, Kelley Predieri, and the many Douglas Anderson High School students who participated in the Douglas Anderson Writers’ Festival.